Renting or building the diabolical plants required for Little Shop of Horrors has long been a factor in whether or not to produce the show. Fortunately, Audrey II plants are available to rent for the length of your run from MTI. All four plants — from seedling to psychopath — are included. Based on Martin P. Robinson’s original designs, but utilizing new lightweight materials, these new Audrey II plants weigh almost half as much as their predecessors. Plants will arrive two weeks prior to the first performance and include one (1) performance week. Rental is only guaranteed with full payment and a signed contract, and is based on availability. A Plant Rental Contract will be sent to you only after your dates have been checked and a plant is available for rental. Rental is for Plants only and does not include the final drop (for "Don’t Feed the Plants"). Blueprints for construction of this drop are included. Each pod requires one puppeteer. Construction materials: heavy gauged, vacuum-formed plastic, covered in fabric (airbrushed with water-based paints), clear silicone and urethane foam. No latex is used in construction. Case with contents weighs 600 lbs. Case with contents weighs 300 lbs. $1200 for three (3) weeks of rental. This includes two (2) weeks of rehearsal and one (1) week of performances. $300 per week of additional rental for any rental time over the initial three (3) week rental period. $500 refundable security deposit (minus any damages to the Audrey II puppets and any costs required for repairs). Freight Charges: The charges can be anywhere around $800 to $2000 for round-trip freight shipping. If your organization can physically pick-up and return the puppets yourselves, then freight charges will not be applied. 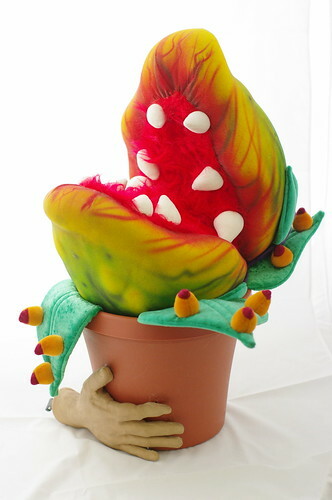 Related shows or resources: Audrey II Puppets, Disney's Alice in Wonderland JR. I am at a high school and I cannot get approval unless I can give our business office the full price of rental with everything included. We are located in Litchfield, CT. We’ve already been approved to do the show and now I need to get the details together for the final contract. Where would we have to pick up an Audrey II rental? Are the Audrey II puppets available for hire to South Korea? How much does it cost to rent Audrey II for the show?